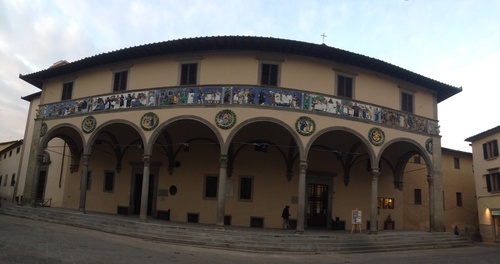 The Ospedale del Ceppo is the most remarkable and characteristic hospital in Pistoia, (Piazza Giovanni XXIII, 15). It was established in the 13th Century, when Our Lady appeared to a married couple, Antimo di Teodoro and Donna Bandinella, who were ordered to build up a hospital exactly in the place where a stump of a tree would bloom in the middle of winter1. 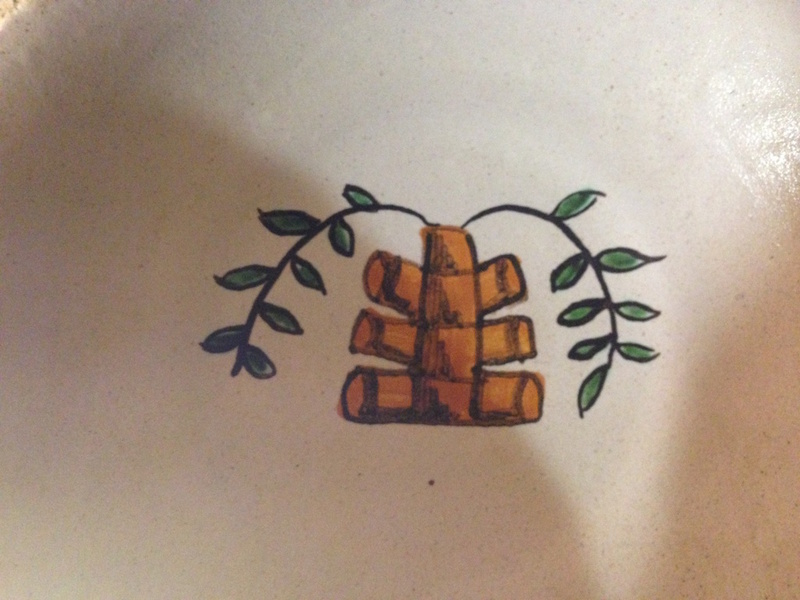 Hence, the hospital was named Ospedale del Ceppo whose symbol is a blooming tree-trunk. According to another tradition, the tree-stump was used in ancient times to collect money offerings from the congregation. At first, it was meant to help the poor and cure the sick; it was particularly useful during the medieval period, when the town was afflicted by the bubonic plague. Initially, the direction of the hospital was given to the cathedral chapter, but from 1350 the commune of Pistoia tried to put the Compagnia del Ceppo under the lay status; thus, the direction of the hospital was given to the Uffiziali of the town. After the conquest of Pistoia by the Republic of Florence in 1401, the Florentines emitted a edict (1424) to officially confirm the lay status of the Ospedale del Ceppo. In 1456 the Florentine architect Michelozzo di Bartolomeo started the restoration of the building commissioned by the administrator of the hospital (spedalingo). The spedalingo, who acted also as rector, was usually elected from the noble Pistoiese families. 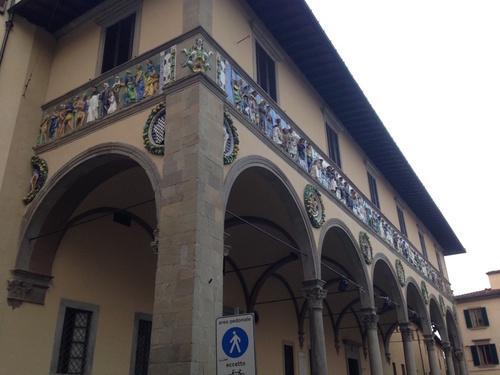 In 1501 the hospital was submitted to the Ospedale di Santa Maria Nuova in Florence. The main frieze on the monumental façade of the building was made in this period by the sculptor Giovanni della Robbia under commission by the Florentine spedalingo Leonardo Buonafede. In 1784 the spedalingo returned to be a Pistoiese and the hospital was aggregated to a new entity including the Pistoiese hospital of San Gregorio: the Spedali Riuniti di Pistoia. The origins of the medical school located in the Hospital date back to the 17th Century. Giuseppe Tigri, brother of the anatomist Atto, reports that teaching activities started probably in 16662. However, it is possible that previous medical teaching, although irregularly held, had been imparted for a long time before in Pistoia. Alberto Chiappelli, a physician and historian from Pistoia, points out that as early as the 14th Century the Town Council allowed a few physicians to take young students along with themselves during medical home visits to teach them their Art. Besides, according to Chiappelli, evidence that the teaching had been brought into the wards of the biggest hospital in town, is given by the representation of the sick call by Giovanni della Robbia. This representation can still be admired on the façade of the Hospital in Pistoia, where a physician, accompanied by his assistants and trainees, visits the sick in a hospital ward. At the beginning, the teaching was confined to Anatomy, Physiology and Institutions of Surgery and surgical practice. 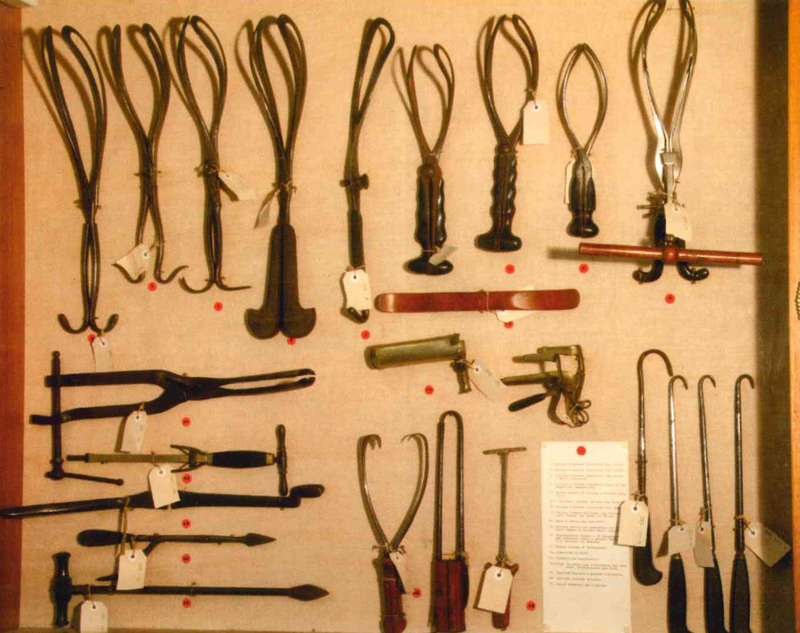 On February 22nd 1754, however, the Grand Duke Francesco Stefano of Lorraine restricted the school activities exclusively to surgical practice apprenticeship, thus excluding the teaching of Medicine.The equipment for the anatomical sections and for the childbirth operations was quite complete and diversified. The official recognition of the school of Medicine became effective only by the new regulations approved by Grand Duke Leopold. The young students were divided into two classes: apprentices practising in the Hospital and apprentices practising outside. To be accepted in the school, young students were required to possess a good knowledge of Latin, geometry and dialectics. Their knowledge were tested by an examination held by the supervisor, who was the Dean of the School, and by a Commissioner, whose task was to choose the best students among the examined, considering also the number of available positions3. The importance of practising abilities was no doubt the main characteristic of the Ospedale del Ceppo's medical school. Lessons should have been attended only after the examination of the sick. The teacher of Anatomy had a room at his disposal and he was assigned all the corpses of those who had died in the wards of the hospital, so that he could dissect them. The school was closed in 1844, as a consequence of the reformation of studies carried out in Tuscany by the Grand Duke's regulations. In the Ospedale del Ceppo's medical school some famous physicians got their training, including the anatomists Filippo Pacini and Filippo Civinini. 1. Giuliano Beneforti, Cronache edilizie dell'Ospedale del Ceppo, vol. 1, op. cit., p. 53. 2. Giuliano Beneforti, Cronache edilizie dell'Ospedale del Ceppo, vol. 1, op. cit., p.56. 3. Susanna Daniele, Il Ceppo fiorito: storia dell'Ospedale del Ceppo di Pistoia atrraverso i secoli, vol. 1, op. cit., p. 25.